Secluded cabin located in a private, gated subdivision. The cabin sits on Musick Creek with two decks that roll down to the creek. The view is the creek and the woods and is very private. Walking distance to Restaurants and shops. Listen to the creek from inside and out. Decorated to preserve the quaint cabin feeling while providing the latest in amenities. This is a real cabin that was originally built in the 1940's and remodeled in 2008. Interior is all knotty pine with maple wood floors in the living room, loft and bedrooms, tile in the kitchen and laundry room, and a rock fireplace. Approximately 1 mile to Shaver Lake. Approx. 20 min. to China Peak Ski Resort. Each bedroom has a queen bed, the loft has two convertable twin beds. The cabin was perfect for our family of four. We enjoyed the coziness of the cabin and the original sink and stove, but with modern touches to the kitchen. We will definitely stay there again. Wonderful stay in this rustic with some modern touches cabin. We took our daughters (9 and 7) to Shaver Lake to see the snow for the first time. This cabin was perfect for our family adventure. The girls stayed upstairs in the queen bed with their own bathroom (tub only no shower), we stayed in the downstairs bedroom. The cabin heats up well, no issues. Fireplace worked great. Kitchen had everything we needed. We went sledding in the neighborhood on fresh snow. Ate at the local pub and pizza place. Roads are snow plowed ona regular basis, had no issues in iur 4WD Jeep, didn't even need to put on chains. Looking forward to planning a summer trip. Well appointed cabin with vintage mountain charm and upgraded bathrooms. This cabin epitomized my imagination of a perfect mountain cabin. It had a nice sized kitchen with everything you need (except no auto dishwasher), a cozy living room with a tv, couch, reading chairs, and fireplace insert that kept everything warm and comfortable even in January when we visited. In addition to the fireplace there are wall heaters in almost every room for added warmth. The downstairs bedroom had lots of natural light and stayed comfortably warm with the wall heaters. Although the furnishings are not brand new, everything looked good and worked well. In my opinion, a mountain cabin should not be decked out like a modern home...I like a rustic feeling and this place met ALL my expectations. It is in an idyllic setting amongst large granite boulders, and has a small creek running right next to the property which makes the patio setting next to the creek feel like your are truly away from it all. 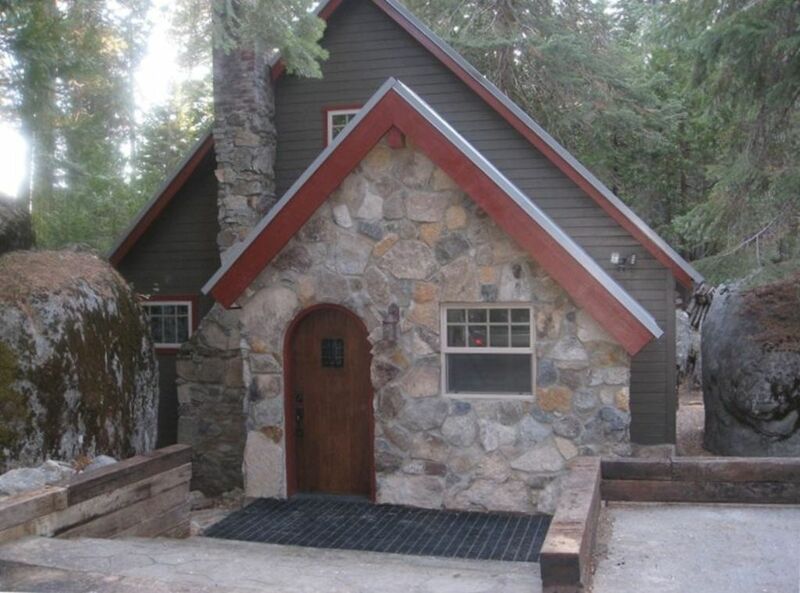 It is close enough to the small village of Shaver Lake that you can easily walk to the store or several restaurants for breakfast lunch or dinner. The upstairs had what I describe as a club room feel with two large comfortable chairs (that can pull out as 2 twin beds), a nice flat screen tv with Dish satellite service, a full bath and cozy bedroom. Although there was no internet, we had decent cell signal for both Verizon and AT&T. The 2 full bathrooms upstairs and downstairs had both been remodeled (shower downstairs and full tub upstairs), and the laundry room had full size front load washer and dryer. This would be a perfect place for a small family or 2 couples to share looking for a mountain cabin getaway. Had a girlfriend visiting from Brazil with her 11 year old son. We went to the cabin for 2 nights -- such a GREAT cabin. The kids absolutely loved having the upstairs area to themselves! Will definitely rebook this cabin -- thanks Beth!! Very good place to stay. It is exactly as described. Fully stocked with everything needed. The wood stove and heater kept us very toasty. Very clean and cared for. Would definitely love to stay again. Owner was very responsive when we messaged her. Great experience! Well stocked cabin. Everything we needed. Little grocery store close by, but you may consider stocking up in Fresno if you plan to cook a lot. Be aware that you need to take your trash out with you, there is no dumpster or trash bin.